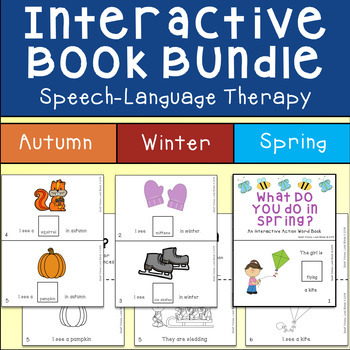 This bundle includes Autumn, Winter, and Spring interactive book packs for a discounted price, for school year-round speech and language therapy books! Each pack includes 2 different emergent reader books and interactive books. Each book includes emergent readers in both black & white and color, and a corresponding interactive version with removable vocabulary pieces. Language targets include: basic vocabulary, action words, simple sentence structure, responding to simple Wh- questions, and more. Assembly is quick and easy. For emergent readers, just print and cut, and they are ready for a language session.